After an AreaOnAreaOverlayer operation, many small but very long polygons are generated in an output File GDB. There are topological errors also. Some polygons even have a negative area (seenfrom ArcGIS) and the calculation of the surface with FME fails. I would like to remove these polygons. It seems that the SliverRemover helps but it takes time. The Snapper and the AnchoredSnapper do not help, as the small polygons are very long. I do not have the MRF2D tools. Attachments: Up to 10 attachments (including images) can be used with a maximum of 4.0 MB each and 4.0 MB total. MRF Cleaner would be a good transformer, becaus you have a lot of parameters to repair your geometries. Maybe the generalizer could be an approach to clean the geometry structure and then try again the Snapper or Anchored snapper. 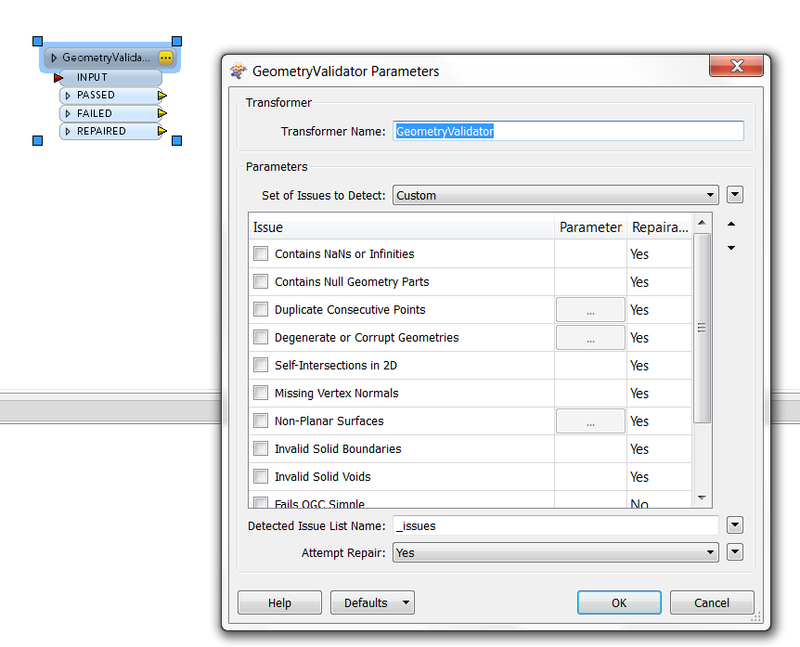 I would download FME2013 and use the greatly improved GeometryValidator that can fix many of your issues automatically!